Make Money With Indian Amazon Affiliate Program ! Home » SEO/SEM » Make Money Online » Make Money With Indian Amazon Affiliate Program ! Amazon affiliate program is great program to make money . If Indian affiliate marketers are finding difficult to make money with foreign affiliate networks like Commission Junction or Clickbank then they have a great opportunity to make money with Indian Amazon affiliate program. Sign-Up process is very easy as you might have done with other affiliate networks. Theimportant thing here is getting affiliate links which you are going to promote through your blog, videos, social media and other channels. You could easily create you links from your dashboard. Your links are HTML code. Whenever you choose a product to promote you will get an ID of that product. Now the ID of the product combined with your Amazon ID you could build an HTML hyperlink in a particular format. You will be placing this affiliate link in your blog and promoting to get sales. Getting affiliate links is very easy as the complete procedure is given. 1. However, the commission is much higher than Indian affiliate programs by Flipkart which offers only 6 percent commissions. 2. To get your monthly income there is option for direct deposit hence you have to rely on checks only. 3. Amazon for Indian customers offers only cash on delivery as the payment option. You need to pay extra Rs 39 for COD. 4. The commission that you get for selling a product from your blog or your website is at least 10 percent which is quite less compared to other affiliate networks. Next important move is choosing a right product from Amazon. You have to choose a product which an online customer would going to like it. 1. The type of product according to your niche of the blog. If your blog is about gadgets like mobile phone then choose only mobile phones to promote not laptops or eBooks. 2. Next, you have to make sure product is of good quality. If you do not like the product yourself then do believe that others are going to buy it. 3. Cost of the product and the commission that you are going to get. 4. Competition that how many others are promoting that same product. First you need to have a blog which is of high authority. It means it receives a good number of visitors daily. So if you are going to promote a product through a branded blog then you need to build your blog to that level. First you have to spend time it getting traffic to your blog only then you could sell Amazon affiliate products. Branded blogs are only good for affiliate marketers which are experienced and have being the business for a long time. Therefore choose this route if you have a great blog or website. Although there are number of ways to promote your products but I am going to tell you something which is more common and easy to do. You can promote your affiliate links through blog, YouTube videos, PPC forms, paid advertisements and many other channels. I would not suggest go for paid medium like Google Adwords. Here you could start getting traffic to your blog instantly but you have to pay heavy price. I am assuming that your budget is pretty tight so you could afford a website or even only a free blog. There are two ways to go about when you are promoting with a blog or website. However, if you are a new blogger then what you could do? Moreover, you have very less amount of time because you cannot wait for years to get traffic. So the best way is to create niche blog which are much targeted. It means if the broader category of your blog is Gadget and your affiliate product is mobile phones then you should write only about mobile phones. Do not write about other gadgets like tablets or laptops. In fact, you could even narrow down at write only about Smartphone’s and not about other mobile phones. Hence, the niche blogs are targeted and you could start selling in few weeks. If you can create videos than YouTube is also a great medium to promote your products. At same time you could get traffic from Facebook and other social bookmarking. 2. But the greatest advantage of this network over others is if a buyer click through your affiliate link & end up buying other product you’ll also get the same commission. 3. Some Products are downloadable hence not any problem for shipments. 4. Amazon is ready to increase your affiliate commission if you are selling products regularly. One more thing that I do not like is for payment there is no direct deposit hence you have to get it through checks. 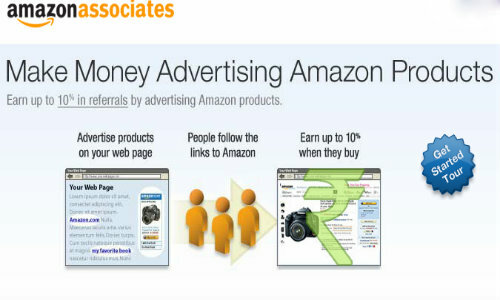 Amazon affiliate network is a great opportunity for Indian affiliate marketers to make money. Other top networks like eBay still do not have an affiliate program for Indian marketers. So for now you could make best use of this network if you have failed with foreign networks like Commission Junction or Clickbank. Ronie is working in an reputed MNC as a brand manager. He is also involved in blogging & affiliate marketing.